Introducing Data Envelopment Analysis (DEA) -- a quantitative approach to assess the performance of hedge funds, funds of hedge funds, and commmodity trading advisors. Steep yourself in this approach with this important new book by Greg Gregoriou and Joe Zhu. "This book steps beyond the traditional trade-off between single variables for risk and return in the determination of investment portfolios. For the first time, a comprehensive procedure is presented to compose portfolios using multiple measures of risk and return simultaneously. This approach represents a watershed in portfolio construction techniques and is especially useful for hedge fund and CTA offerings." GREG N. GREGORIOU is Assistant Professor of Finance and coordinator of faculty research in the School of Business and Economics at the State University of New York (Plattsburgh). He received his BA in economics from Concordia University and his MBA and PhD in finance from the University of Quebec at Montreal. He is an associate with the Peritus Group in Montreal and the hedge fund editor and an editorial board member for Derivatives Use, Trading and Regulation (London). Gregoriou has published over forty articles on hedge funds and CTAs for peer-reviewed publications such as the Journal of Futures Markets, European Journal of Operational Research, Annals of Operations Research, European Journal of Finance, and Journal of Asset Management. 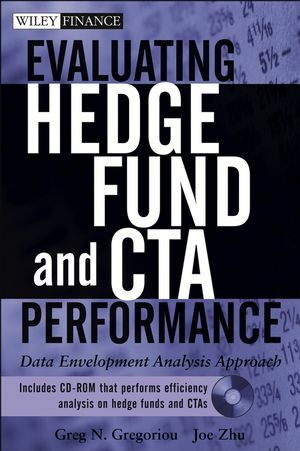 He is coauthor or coeditor of three books on hedge funds and CTAs: Performance Evaluation of Hedge Funds; Hedge Funds: Strategies, Risk Assessment, and Returns; and Commodity Trading Advisors: Risk, Performance Analysis, and Selection (Wiley). JOE ZHU is Associate Professor of Operations in the Department of Management at Worcester Polytechnic Institute. Zhu received his PhD in industrial engineering and operations research from the University of Massachusetts Amherst. Zhu has published two books focusing on performance evaluation using Data Envelopment Analysis and has developed the DEAFrontier software. An associate editor of the Omega journal, he is an expert in methods of performance measurement. Dr. Zhu has published over forty refereed papers in journals such as Management Science, Operations Research, IIE Transactions, and the Journal of Operational Research Society. Chapter 1: Fund Selection and Data Envelopment Analysis. Markowitz Model and Sharpe Ratio. Chapter 5: Data, Inputs, and Outputs. Preparing the Data for DEAFrontier. Chapter 6: Application of Basic DEA Models. Chapter 7: Application of Returns-to-Scale. Chapter 8: Application of Context-Dependent DEA. Chapter 9: Application of Fixed- and Variable-Benchmark Models.